I wanted to read some fantasy, I liked the blurb. The Banished of Muirwood revolves around a really cool idea (origins of which are explained in the Author's Note at the end of the book), set in a really cool world. It features a main character, Maia, with a couple of secondary ones supporting and/or hindering her in her quest. There's some great magic-flavour, and some deep worldbuilding--really, all the elements of great fantasy fiction. The book ticks lots of important boxes. I really did enjoy reading The Banished of Muirwood. Even the pacing was good, which written that way, I realize, makes it sound like a surprise. Really, it's that in last year or two, I've often had a hard time transitioning between romance/new adult books that have a different pace to them then fantasy tends to. That said, I did have an issue with The Banished of Muirwood that resulted in my 3.5 star rating for the book. Namely, there's a plot point used to bring the story together that I thought really reduced or negated a lot of the main character's agency. It's not to say that it minimized Maia's struggle or quest, rather I felt a little cheated by it. Now, in the bigger picture--because this is the first book in a trilogy--maybe this will be an amazing choice, and I'll come to realize how necessary it was. But at the moment... I kind of wish the book had gone in a different direction. 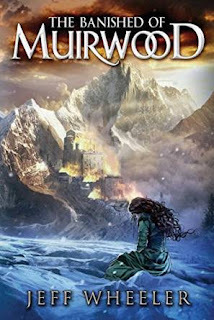 If you love fantasy, and you're looking for something a little different, The Banished of Muirwood could be the book for you. There's a lot to love in it, and I will be back for the second book.